The security of mobile devices to this point has been restricted to a personal identification number or a simple swipe of the finger on the screen. With the amount of personal information readily available to anyone who happens to open your device without your knowledge, any additional security would be welcome. As luck would have it, Apple has been reportedly working on adding in a fingerprint scanner to its devices for a few years, with the rumors rising again as the reveal of the iPhone 5S draws near. Though Apple has already patented fingerprint scanning technology of some sort in various stages, that didn't stop the Cupertino company from returning to the U.S. Patent and Trademark Office once more for yet another potential mobile fingerprint reader. 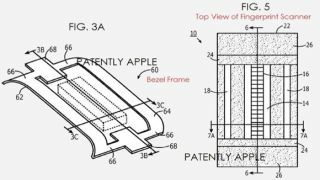 According to Patently Apple, a patent was been filed in February for a fingerprint scanner that could be hidden within the bezel of any given device. The security feature is different from earlier attempts from Apple, in that this would be an actual sensor somewhere on an iPhone (for example), but not hidden under the display. This new method is possible thanks to some Apple engineers discovering a way to encapsulate both the bezel and the sensor together, which not only allows the completed scanner to be smaller and more compact, but also protects it from any environmental hazards that could potentially mess with the delicate hardware. Operation is then easy enough, as the fingertip is swiped through the sensor, and a small amount of current is passed through the bezel to the finger to provide a more accurate reading. The sensor is only capable of creating a 2D image, so the mild current not only helps accuracy, but helps the software actually render the complete fingertip with ease. Though the patent didn't reveal any information about when the scanner might be put to actual use in any of Apple's products, this latest iteration only serves to show how serious the company is about making good use of its AuthenTec acquisition. We wouldn't be shocked to see the fingerprint scanner make its debut with the next iPhone, but with the amount of patents filed that never see the light of day, this could just as easily vanish into the USPTO's file cabinets. Apple swears it hasn't been party to the U.S. government's Prism program, and claims it has proof to back its statements up.